Exhibit open to the public, free of charge, 9:00 a.m.-5:00 p.m. weekdays excluding holidays. Opening reception December 20 at 6:00 p.m.
Daniel Hauben, celebrated for his deep explorations into urban landscape, has been painting along Bronx streets, parks, and from windows and rooftops for nearly 30 years. Irma Ostroff’s paintings, in vibrant color, are abstract and geometric, subtly influenced by the architectural landscapes she experiences. David Judelson’s work investigates the relationship between form and structure. Alan Feigenberg’s photographs address both person and personality in the built environment. Albert Vecerka, celebrated ESTO photographer, exhibits both his professional architectural work as well as his personal investigations of the architectural environments he has documented. Five Artists + Architecture is an exhibition presenting and celebrating the works of five artists who have been teaching for decades at the Bernard and Anne Spitzer School of Architecture at the City College of New York. Since its founding in 1969, the school has always offered students the opportunity to integrate a wide range of visual arts studies into their studio design education and their design research work. The artists presented in this exhibit continue the tradition of their predecessors (Candido, Lionni, Roos, et al.) by adding the tools, techniques, and sensibility of their endeavors, their art, and their craft to the student experience and working vocabulary. Inclusion and diversity are integral to the school. This is reflected in the cultures and languages of both the students and faculty. This is also true of the variety of works by the five fine artists represented. Painting, sculpture, and photography are married, for the first time, in the Atrium Gallery and illustrate the breadth of opportunity available to the students. Artists have always held a privileged if somewhat ambiguous position within modern schools of architecture. At the Bauhaus, “form masters” like Johannes Itten, Paul Klee, Wassily Kandinsky, and Josef Albers played a unique role in the life of the school, and indeed made seminal contributions to its design pedagogy. Albers, László Moholy-Nagy, and György Kepes brought this tradition to the United States in the 1930s, inculcating their powerful “new vision” in architecture students. During the second half of the twentieth century, as architecture education became increasingly professionalized, as the university structure reinforced the tendency to disciplinary specialization, and as a technological orientation displaced the remnants of the Beaux-Arts system, the fine arts were further marginalized within the curriculum. However, there were always significant exceptions to this trend, especially at schools with an adjacency to major art institutions or communities. Interrelations between architects and artists continued to evolve in the 1970s and ’80s in synch with changes occurring in the art world, and postmodernism brought a new affinity for artistic forms of representation and more subjective approaches to architectural knowledge. At a practical level, almost all architecture schools have continued to offer courses in subjects like drawing, two-dimensional design, color, and photography. These have frequently been taught by practicing artists. While the artist is no doubt more of a rara avis on the architecture faculty today, especially since the advent of the computer, she or he remains a deeply valued presence in the school, bringing much-needed aesthetic sensibility and an inspirational point of view to an ever more pragmatic discipline. 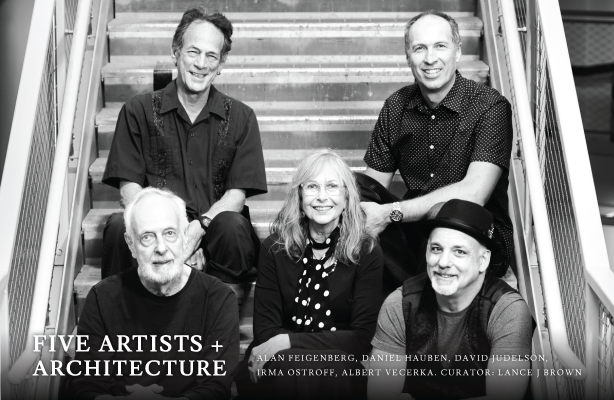 The Riverdale Press: "It's All About Perspective for These Architecture Professors"
Architectural Record: "Exclusive Look at Architectural Photos by Albert Vecerka"